Let's get physical§§Tom's cowboys, loggers, roughnecks, and roustabouts§§As a boy, Tom's first crush was a strapping young farmhand who worked the fields around his family home. Finland is a land of tough physical men, catching fish in the icy sea; cutting logs in the endless forests; threshing oats, rye, and barley on the farms. Tom, a more sensitive boy, admired these rough men and their distinctive clothing, designed for protection and utility. He later said, "When I was young, leather was worn by people who worked outside because it was warm. All the men who wore leather, they were the type of men which I adored. "§§When he began to draw he celebrated these early idols, improving their wardrobes with tight jeans, faded T-shirts, and thigh-high beak-toed Lappish boots. It was a young logger in this gear who appeared on the spring 1957 cover of Physique Pictorial, introducing Tom to the world. In the decades to follow Tom added truckers, repairmen, construction workers, circus roustabouts, and the American cowboy to his roster of working-class heroes. 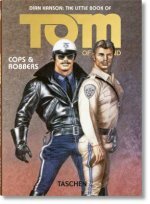 Though just sexual fantasies for him, his portrayal of blue-collar lovers helped working class gays accept their true selves.§§The Little Book of Tom of Finland: Blue Collar traces Tom's fascination with working men in one compact and affordable package. A brawny lineup of multi-panel comics and single-panel drawings and paintings is set alongside archival and contextual material, including historic film stills and posters, personal photos of Tom, sketches, and Tom's own reference photos.